ON THIS DATE (May 3, 1938) ... In the highest-tension contest of the local baseball season to date, the incomparable Robert Moses Grove turned his favorite trick of hurling the Red Sox to victory over the Detroit Tigers, 4 to 3, in 10 innings before 4,500 sun-bathed spectators at Fenway Park today. In the course of repulsing the initial invasion of the season by a Western club, the 38-year-old Old Man of Lonaconing Mountains also signalized an historic landmark in his brilliant career by passing the coveted 2,000-mark in strikeouts. The arresting event was virtually crowded into oblivion, though, by the courage which the veteran was forced to display in overcoming the potent Tigers for his third win of the present campaign and 51st triumph in 65 starts against the Detroiters for all time. 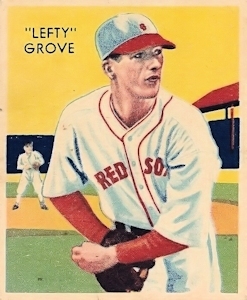 He was pounded for 12 blows and tossed in six walks to boot, but the only times the desperate visitors were able to pan pay dirt was in the second innings when big Greenberg lifted his fourth home run of the season over the whole works in left field, and then in the fifth when batting champion Gehringer poled a 350-foot homer into the first-base pavilion and scored behind Roxie Lawson, who had beaten out a single.